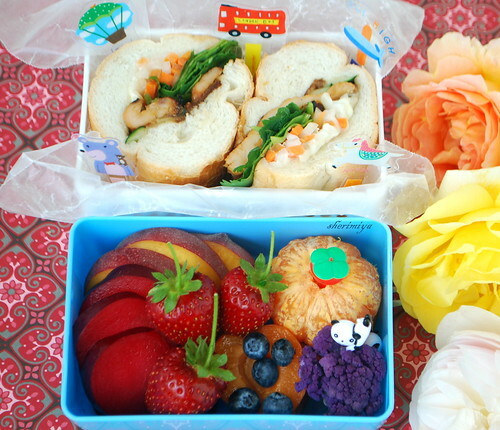 Banh Mi, Early Summer Version Bento, originally uploaded by sherimiya ♥. What, you say we've already had a banh mi bento recently? Really? Let me check...nope, last one was 2 months ago! But it's true I've made other kinds of sandwich bento in the meantime. Let's face it: sometimes it's easier to make a sandwich bento than prepare "real food" and there's nothing wrong with that. Today was such a lovely day, we spent most of it outside and I didn't do any cooking at all. We got Vietnamese takeout and took home some banh mi for lunch. Today it is chicken. I cut it in half and added extra spinach and cilantro to fill out the green veggies, then wrapped in wax paper and snuggled them into the basket part of my Keroppi bento box. The lower tier is just big enough for some early summer fruits: white peach, rich red plum, golden apricot, tangerine, blueberries, and more homegrown strawberries. Oh, and some purple cauliflower because I am in love with the vivid hue. I live for summer fruits, and these are just the beginning. The plum is still a little tart, but I really do like them like this. The peaches are super sweet. And the strawberries -- well, these are bigger than the mini ones I packed a few days ago, and they are bursting with sweet flavor. It's such a treat to enjoy fresh picked fruit, and if you can't grow a fruit tree, you can definitely try a strawberry plant. They're very small and prolific; you can enjoy a handful of fruit with each bloom. And they're so cute! I'll try to remember to take pictures of the baby fruit as it matures from a tiny green berry into a luscious red one. You'll be hooked. This is MisterMan's last bento of the first grade. It makes me a little nostalgic, just like at the end of kindergarten. He's growing up so fast and I always wonder how long he'll be agreeable to taking bento for lunch. He's still the only one in his class having bento for lunch, and so far the response by the other kids has been positive. The girls especially -- he says they come over and say "Awwww, so cuuuuute." I guess the boys are too manly for that. Anyway, I'll still have TinySprite to make bento for. She'll start preschool this summer, hopefully. She's much pickier than her brother, so it'll be more of a challenge! End of school marks the beginning of summer for us so.. Happy Summer, Bento Friends!! Sounds like you had a relaxing day. :) The sandwiches look tasty, as do the fruit sections. And those strawberries! Mmm. So fresh and ripe looking! Yumm-o!!! I haven't had a banh mi in such a long time, I'm waaaaay over due! Beautiful bento and I love, love those perfect little strawberries! yum, bahn mi is always a welcome refreshing taste, and a welcome break from cooking over a hot stove! i love how you've filled the corners with cute baran, and the fruit (+1 veg) section is bursting with color and flavor as usual. congrats to misterman for finishing 1st grade, i'm sure you are nostalgic and proud at the same time. hope you guys have a wonderful summer! there's always room for bahn mi! The perfect summer lunch in my book! Have you ever tried to freeze the purple cauliflower? I wonder if it would dull the color? Examining this bento so happily, I love every sweet detail! Unique and happy baran, sumptuous garden roses, and a symphony of late spring fruit are just a joy to behold...not to mention the fresh and yummy banh mi! Congrats to MisterMan! A heartfelt congratulations to Misterman! Have a fun summer vacation Misterman and to sheri and of course TS too! hypothermya, I'm loving the strawbs, hope they keep coming over the rest of the summer! Thanks! Susan, time for banh mi! thanks! Cat, yes, always room for more banh mi! Never tried freezing. No idea what would happen. When I steam, some color leaches out. It would be even more vivid otherwise. I love your blog! I have been interested in the whole bento idea for a while and I am just about to dive in...I blogged about your site -- hope you don't mind! I couldn't help but share your awesome bentos. Thanks a lot for blogging my site, much appreciated! You'll have fun making bento for your kids. There is a lot of inspiration in the bento community and I look forward to seeing your bento soon! P.S. Shinzi Katoh is awesome! Mine aren't anywhere near store size either! But don't worry, they'll be big on naturally ripe taste!